This delicious Roasted Beet and Orange Salad with Citrus Vinaigrette makes a wonderful addition to a special meal. 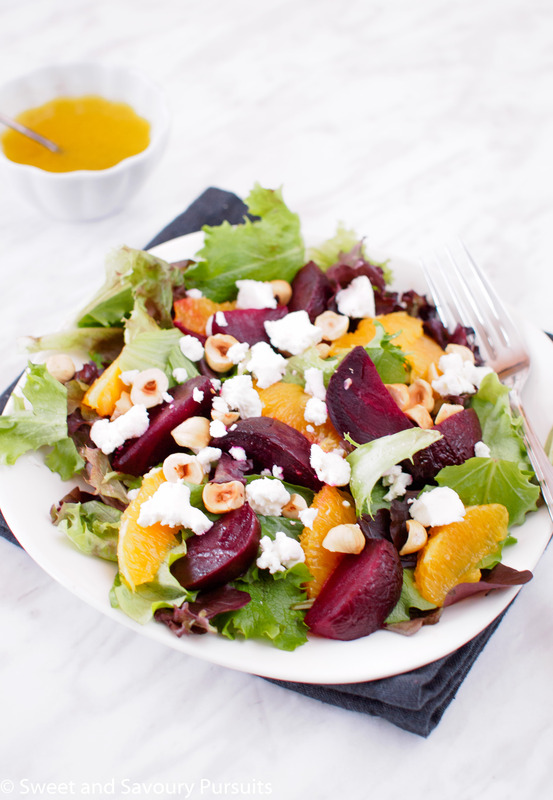 There are so many things I love about this Roasted Beet and Orange Salad. All of the vibrant colours coming from the beets and oranges make this citrus beet salad so beautiful. The sweet and tangy citrus vinaigrette complements the earthy taste of the beets perfectly. The creaminess of the goat cheese and the crunchiness of the toasted hazelnuts give this salad so much texture. This is an excellent winter salad, perfect for an occasion where you want something special but want to keep things simple. One way to speed up the process of making this salad is by roasting the beets and the hazelnuts the night before or the morning of the day you want to serve it. To roast the beets simply preheat your oven to 400°F, remove the tops and roots of the beets, wash the beets well and drizzle them with a bit of light tasting oil. Wrap them individually in foil and roast the beet packages on a baking sheet until you can easily pierce the beets with a knife, about 45 minutes. Carefully open the foil packages and let the beets cool. Once the beets are cool, remove the skins and cut the beets into small wedges. If you are using raw hazelnuts roasting them will help bring out their flavour and will make it possible to get their skin off. The easiest way to roast hazelnuts is to spread them on a baking sheet and roast them in a 350°F oven for approximately 10 minutes or until their skins begin to split and the hazelnuts begin to turn lightly golden. Remember to stir the hazelnuts mid-way while roasting. Remove them from the oven, let them cool just slightly and place them in a clean dish towel, let them sit a minute and then rub them together to loosen their skins. All that will be left for you to do when assembling the salad will be to wash the greens, segment the oranges and make the vinaigrette. Top your salad off with the roasted beets and hazelnuts and some goat cheese. If you don’t have any goat cheese or don’t like it, you could also use Feta cheese. Enjoy! 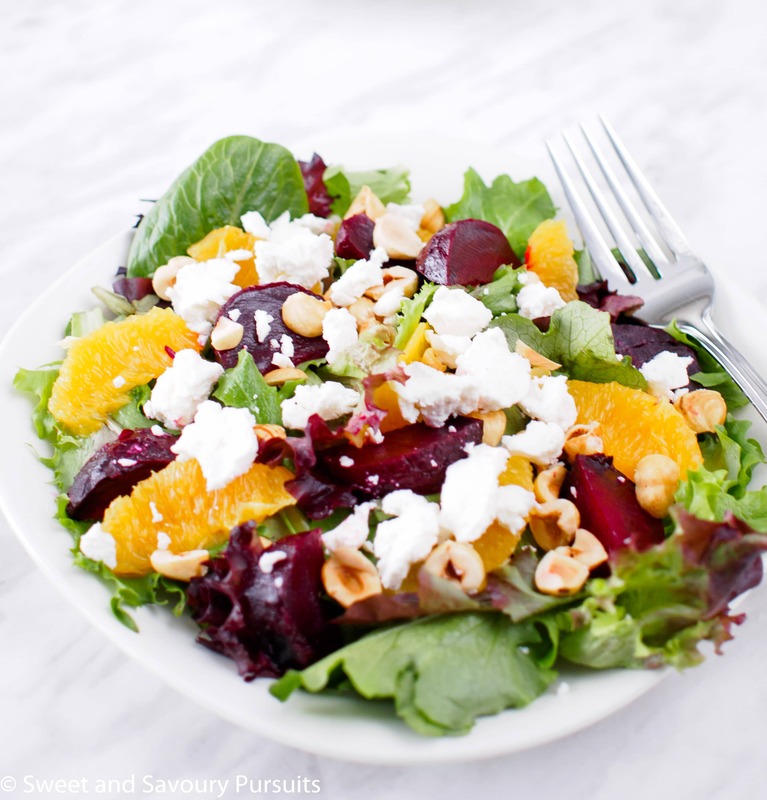 A delicious Roasted Beet and Orange Salad with Citrus Vinaigrette, toasted hazelnuts and creamy goat cheese. Preheat oven to 400°F. Wash beets very well, drizzle with a bit of olive oil, rub them with the oil and wrap them in foil. Roast the beet package on a baking sheet in the oven until you can easily pierce the beets with a knife, about 45 minutes. Carefully open the foil package and let the beets cool. Once the beets are cool, remove the skins and cut the beets into small wedges. Set aside. Segment the oranges by slicing a bit off the top and bottom of the orange with a sharp pairing knife. Remove the skin and the pith of the oranges and then working over a bowl, cut between the membranes of the orange. To make the vinaigrette, combine the olive oil, freshly squeezed lemon and orange juice, honey, salt and pepper and whisk until the dressing has emulsified. Set aside. Arrange the roasted beets and segmented orange pieces over the salad and then top with goat cheese and hazelnuts. Drizzle the dressing over the salad and toss well or serve the dressing on the side. *To toast the hazelnuts, spread them on a baking sheet and toast them in a 350°F oven for 8 to 10 min., stirring mid-way. Remove from oven, let cool only slightly, place them in a clean dish towel and rub them together to loosen their skins. We made this for dinner last night. Enjoyed it thoroughly, paired deliciously with the quiche my wife made. We did make two small changes. Because we are in Texas, we used pecans instead of hazelnuts and queso fresco for the goat cheese. Going to make it again. This salad sounds and looks wonderful–I love the colors! And beets are so good for you! Sorry you had some recipe disappointments–I know how frustrating that is! Gorgeous salad, I love beets and citrus. Love the combination, I could eat this every day!! This is definitely a restaurant worthy salad, so beautiful and with so many different textural and color elements! I love salads like this with lots of good stuff in them. Beautiful and thank you f=so much for joining us this week at Fiesta Friday! Thank you! It’s my pleasure to be part of Fiesta Friday, there are always so many tasty things. You mention honey but I was curious what the quantity is for this recipe? Thank you for letting me know Butool. I made the correction in the recipe.